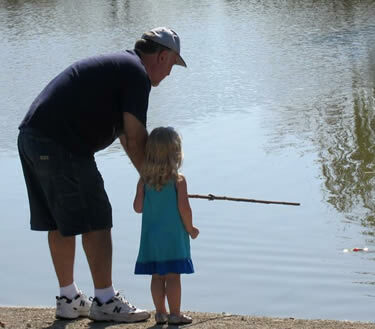 Whether wandering off at a roadside rest stop, getting washed to another location by high water, taking the wrong turn on a trail, or any of the many possibilities out there, your child might need to know something about surviving outdoors. Survival is a big term and includes everything from building career and interpersonal skills to basic “staying alive” knowledge. In this article, I’ll address the latter: basically, staying alive until someone can get to you. This kind of situation has a higher probability of occurring than some of the others. If you’re not used to being in the outdoors, try camping and other outdoor activities that are easily done to familiarize the family with being outdoors: the sights, sounds, smells, sleeping on the ground. That will reduce the freak out factor if someone ends up lost outside. Here are suggestions for some very basic points to cover when teaching your child about outdoor survival. 2. Stay put. Your best chance for survival is to stay in one place. By doing this, you reduce the energy you would use rambling around, and you’ll give searchers a better chance of finding you. Some people use the “Hug a Tree” method to teach kids that important lesson. 3. Stay visible. Hang a bright cloth to blow in the wind. Flash a mirror. Make three of anything in a prominent place. Make three piles of any materials in triangle shapes in the open. Have three small fires ready. Three things placed together signals distress in the wilderness. An important note about helping searchers. Parents these days wisely teach their children to stay away from strangers, and there’s no question that it’s a good idea. However, the result of this has been that some children have hidden from searchers. One example is Brennan Hawkins: an 11-year-old boy lost in the woods in Utah for four days in 2005. Find a way to help your child understand that watching out for “stranger danger” is necessary but, when she/he is lost, it is important to be found. 4. Stay noisy. Whistle. Smack two rocks together. Bang on something that will make noise like a bucket or an abandoned car with a stick or rock. Shout. 5. Establish a Home. If you have to move around a little to find shelter, water, fuel for fire, or a way home, establish your “Home point” or “Center of Base” so you have a point of reference. Take a good look in all directions. Notice any clear landmarks. Mark this place in some way that can be seen from a distance: a pile of rocks, a bright cloth, etc. Keep track of this as you search. 6. Reduce Exposure. When looking for shelter, find ways to reduce exposure to heat, cold, wind, or water. A fallen or leaning tree can be a good place to stack branches on one side, then put other plants, palm fronds, etc. on top. Caves can be very good shelters if they are safe from collapse and not already occupied. The branches of living trees can create shade and shelter. Close in the sides with brush or other materials. A 12-year-old boy named Jared Ropelato got lost in the woods and built a shelter of wood and tree branches and covered himself with dirt. This kept him warm enough to survive a 31-degree night and to eventually get found by searchers. 7. Find Water. Depending on the situation, you can last only a few days without water. Find water before that; preferably before the end of the second day. A spring, running stream, rainwater, or dew are options. See my previous articles on water for more information. 8. Build a fire. 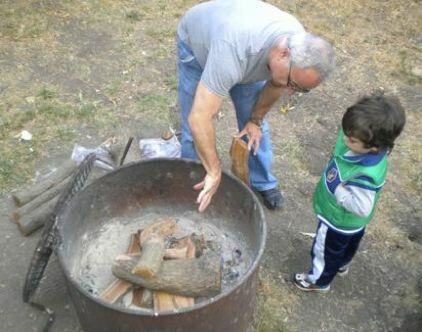 Show your child how to build a fire and how to make one that will produce enough coals to stay hot for many hours but not so big that you have to spend a lot of time gathering more fuel to keep it going. Have plenty of extra firewood available; you won’t want to get up and search for fuel in the middle of the night. You’ll have to assess your child’s ability to be safe with matches but, if safe, you might consider letting her/him keep a small container of matches whenever in the wilderness. Wood, dried dung, and other items can burn. Green wood or plants can be ready to throw on the fire and make smoke if you hear or see someone. Try to keep your fire safe by putting rocks around it that are not from a river (these might have a little water in them that will heat up and explode), and building it in a safe place that won’t spread a fire quickly through the area. You have enough trouble without being surrounded by a wildfire. 9. Find safe food. Some people might be surprised to see that finding food is pretty far down this list. First, depending on the child, children can go about one week without eating. Second, there are foods in the wild that can make a child sick or worse. Being sick is only going to decrease your child’s chances of survival. Eat bugs. There are lots of insects in lots of places, they’re easy to gather, and they can provide useful nutrition. As a rule, tell kids not to eat caterpillars, bright bugs, or ones that can bite or sting you. All insects can have harmful parasites, so cook any of them. Remove the legs, head, and wings. Cockroaches (yes, cockroaches! ), crickets, dung beetles, earthworms, grasshoppers, June bugs (some Native Americans roasted them and ate them like popcorn), locusts, grubs, and cicadas are some of the many edible insects out there. Unless you’re sure what the berry is, don’t eat it. In general, you can’t tell how edible a berry is by its color. There is one exception: almost all white berries are toxic. Be careful about eating plants. There are many different kinds of plants out there: some good, and some bad for you. These plant types vary from one place to the next. Think about taking a wild edible plants course from a good teacher before you end up stuck in the outdoors. Fish. If you are near accessible water and they are caught easily (tide pools, good clear areas of stream, or similar places), fish, crawdads, etc. are a good choice. Small animals. Squirrels, rabbits and birds all can be harvested with simple tools like a stick, rock, or piece of string and some luck. Tip: work with your child at home regarding preparing animals. Maybe start with some chicken from the store, and then move on to cleaning a fish or other animal. This kind of mental preparation makes it seem less foreign if your child needs to do this to eat. The ideas in this article really are just the beginning of teaching a child to survive. However, they are important basics that might help your child to stay alive if lost outdoors. Here’s to happy, healthy children who can keep themselves safe, alive, and thriving. In an upcoming article, we will explore similar issues with a child’s survival in an urban setting. Great article! I need to learn some of these things myself. Is Federal Government Targeting Doomsday Preppers for Our Safety or Theirs?